This Celtic stained glass suncatcher features an Irish blessing along with a pot 'o gold. The blessing on this plaque is: Luck of the Irish. This plaque is a stained glass sun catcher that features an Irish blessing along with a pot of gold at the end of the rainbow. 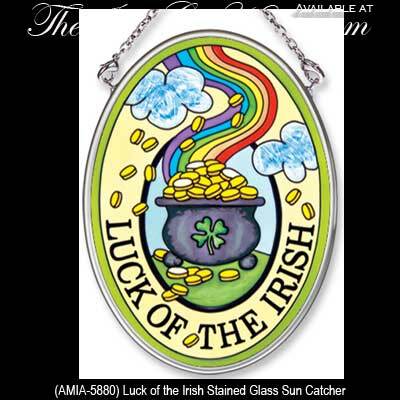 The colorful Irish sun catcher is enhanced with textured glass that is surrounded with a metal rim; it measures 3 1/2" wide x 4 1/2" tall oval and included a metal chain for hanging. The stained glass Irish plaque is gift boxed, complements of The Irish Gift House.